The roofing of the Carrasco International Airport in Montevideo, Uruguay, consists of great steel arches and V-shaped columns. 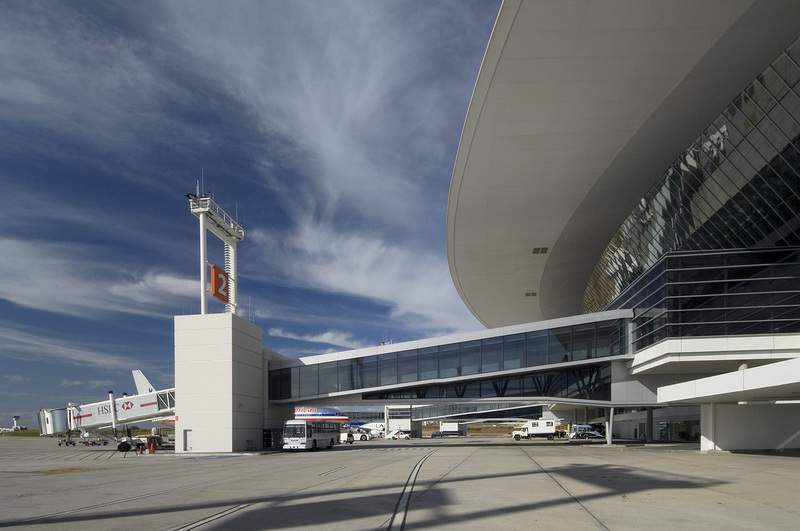 The new airport, designed by Rafael Viñoly stands 11 miles (17.7 km) to the east of Montevideo, in an area 1 km west of the old terminal. The design is very iconic, thanks to the large-scale roofing that calls to mind the aerodynamic lines of aeroplanes, obtained with a structure that is both simple and complex at the same time. Indeed, the designers have designed roofing that lies above an independent structure made of cement beams and columns, created in order to manage the flow of passengers and the airport offices. The roofing is therefore nothing other than a great cover with a steel lattice type structure, supported by four tree-like columns, each made up of four V-shaped branches. These have the purpose of bearing the weight of the great beams running from one side of the building to the other, leaving and reaching the ground crossing the whole airport. All this after rising up to a height of 37 metres, forming the far from obvious shape of a giant 1,200 ft (365 metre) arch. The 92-metre gap between the columns is filled not only by the east-to-west arches but also by north-to-south stiffening beams every 9 metres. These are joined to those provided for bracing that limit the minimum fluctuation of the roof to only about 5 cm, in spite of the fact that the maximum wind loads are equal to 18,000 KN, and the cantilevers, then, are certainly not minor, since they reach 33.5 metres to the north and 26 to the south, and 15 metres to the east and west. Which is quite impressive. The covering is made of three materials, all white, that is to say a thermoplastic membrane over the vault, metal panels along the line of the eave and in the visible turn-ups and, lastly, a titanium-based vinyl membrane for the inside false ceiling. The rainwater is collected along the edges of the roof from where it is carried into special tanks at the feet of the supporting arches and then recycled for irrigation purposes. All the plants, on the other hand, are located in the basement, enabling them to reach their best performance levels, recycling the cooled indoor air and exploiting that already at a suitable temperature in autumn and spring. Because of this technical expedient considerable energy-saving is achieved during the course of the year, in spite of the presence of two 6 mln BTU/hr turbogas boilers. Owner: Puerta del Sur S.A.
Code Consultant: Hughes Associates, Inc.